San Dimas | Remains of L.A. I told David (my husband) that he could choose which restaurant we’d go to tonight, and after a great deal of deliberation he decided on Pinnacle Peak (a perfect choice to show that I really mean “in and around” L.A., and that 1967 is actually a long time ago now, even if you wish it wasn’t.). 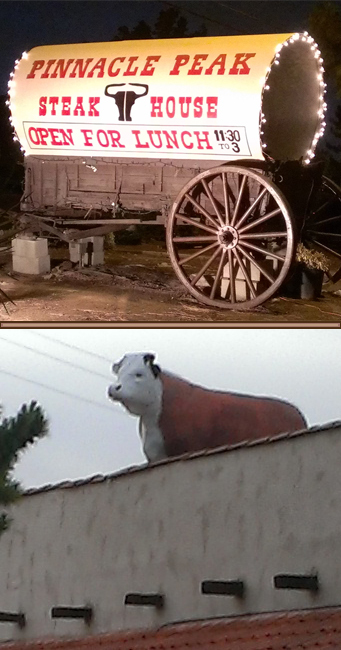 Their sign is a covered wagon, and there’s a cow on the roof. The cow isn’t really doing anything, and it isn’t lit up at night, like the sign is. It’s just a cow, standing there, on the roof. Categories: Restaurants | Tags: 1967, Barbecue, cowboys, cows, Los Angeles, Restaurants, San Dimas, Ties | Permalink.